JACKSON, MS–It’s the first weekend of college football in the month of November, the time of year where every play and every yard earned could be the difference in a win or a loss in the standings. It’s the pivotal fourth quarter of the college football season. With teams competing for spots in their respective conference championship games, that means conference games will be intense, hard-hitting physical matchups will be witnessed and players’ emotions will run high as they leave it all on the gridiron for a chance to play another game at the end of the regular season. In a season where the offensive coordinator of a team resigns and a head coach is fired, one could easily think the season is a total loss and the current coaching staff should begin preparing for the offseason. Against Southern – a team that currently sits atop the SWAC West division – had its way with the Tigers, putting up 259 yards of total offense with 198 coming on the ground. Although the Jaguars went 4-of-16 in third-down situations and only recorded 13 first downs in the game, Jaguars quarterback Ladarius Skelton made all of the right plays against the Tigers’ defense that came into the game ranked second in rush defense. Skelton finished with 98 yards on 13 carries and threw for 61 yards and touchdown. Combining his performance with a Jaguars’ defense that scored twice off Tigers’ turnovers and stellar play from the special teams’ unit, the Jaguars were locked and loaded in their 41-7 win over the Tigers. 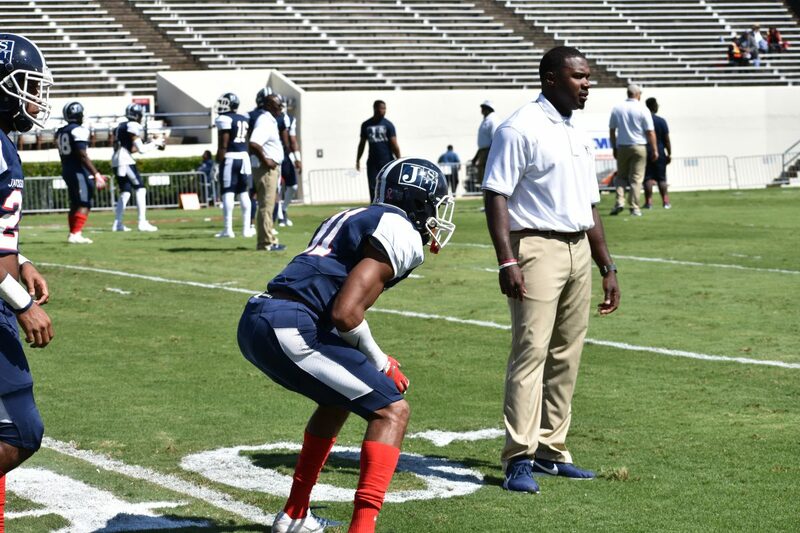 For Jackson State, a program that saw its then offensive coordinator resign in September and fired coach Tony Hughes less than 24 hours after a disappointing loss to Southern in the BoomBox Classic, it is not time to throw in the towel yet on the 2018 season. Well, at least not on paper. Jackson State (3-4, 2-2) is still in the hunt for a shot to represent the SWAC East in the 2018 Toyota SWAC Championship game on Dec. 1. While many would not put JSU as a serious threat to compete for the SWAC East title, the way the Tigers’ play in their last three games of the season and with some help from other division teams could easily put them in a position to compete for a SWAC title, something they have not won since 2007. The quest, however, for JSU to remain in the hunt starts Saturday afternoon as the Tigers play Prairie View A&M at Mississippi Veterans Memorial Stadium, hoping to secure a much-needed win after a two-game skid since defeating Mississippi Valley 23-7 for homecoming on Oct. 13. In their last eight meetings dating back to 2010, both teams have won four times, with the Panthers winning the most recent four. The last time Jackson State defeated Prairie View was in 2013, when the Tigers won 51-38 at home behind the play of then quarterback Clayton Moore, who threw for 235 yards, four touchdowns and rushed for 104 yards and a touchdown. Prairie View (3-5, 2-2) will not be an easy game for Jackson State. The Panthers enter the game with several playmakers on offense and defense that will be looking to rebound after losing their homecoming game against Alcorn State 27-13. Against conference opponents, the Panthers rank sixth in scoring offense (24.3 points per game), third in total offense (448.3 ypg) fourth in rush offense (177.8) and first in pass offense (270.5). Prairie View’s success on offense comes in the play of quarterback Jalen Morton, who leads the SWAC in total offense. Morton completes 56.4 percent of his passes and has thrown for 955 yards and five touchdowns, third best in the conference. Morton also has the ability to make plays with his legs as he has rushed for 378 yards on 49 carries and four touchdowns, averaging 7.7 yards per carry and 94.5 yards per game. Along with Morton as a dual-threat quarterback, the Panthers feature a running back in Dawonya Tucker, who has rushed for 269 yards on 55 carries and averages 67.3 yards per game. Tucker sits ninth in rushing yards against SWAC competition and ranks seventh in all-purpose yards. Morton has a plethora of weapons to catch the ball that includes wide receivers Markcus Handy, Zarrian Holcombe and Tristen Wallace. Handy ranks sixth in the SWAC and leads the team in receptions and yards, hauling in 16 catches for 233 yards and two touchdowns. Handy averages four catches per game and averages 58.3 yards per game. Holcombe has tallied 168 yards on 10 catches for two touchdowns, while Wallace has 11 catches and 164 yards on the season. JSU interim head coach John Hendrick – the Tigers former defensive coordinator – and the Tigers coaching staff will have their hands full in stopping the Panthers explosive offense that also ranks fourth among conference opponents in first downs per game (21), fifth in third-down conversions and third in field goals made this season. Despite the disastrous loss to Southern, Jackson State enters the game ranked sixth among conference opponents in scoring defense (24), third in total defense (giving up 329.8 ypg), third in rush defense (124.3) and sixth in pass defense (205.5). With Hendrick now at the helm, those numbers will certainly be put to the test on Saturday afternoon. Offensively, Jackson State will look to bounce back and re-establish itself after the Tigers were held to 229 yards of total offense, a unit that normally averages over 300 yards against conference teams. The running game – the Tigers bread and butter on offense – was limited to only 32 yards on 24 carries averaging a dismal 1.3 yards per attempt in the contest. Jackson State enters Saturday’s game in the bottom half of SWAC, sitting seventh in rush offense (127.8) and seventh in pass offense (173.8) and ninth in third-down conversions. Tigers running back Jordan Johnson leads the team in rushing with 305 yards and two touchdowns, followed by Keshawn Harper with 136 yards on 19 carries and a touchdown. Quarterback Jarrad Hayes is completing 63.8 percent of his passes and has thrown for 408 yards and three touchdowns. Hoping to establish a sense of balance on offense early on, JSU will face another SWAC West defense in Prairie View that is fifth in scoring defense (23.5), seventh in total defense (424 yards), seventh in rush defense (212.5) and eighth in pass defense (211.5). Key playmakers in the Panthers defense to keep an eye on are safeties Drake Cheatum (30 total tackles) and Will Skinner (26 total tackles), linebackers Anthony Stubbs (29 tackles) and Willie Green (27 tackles and second in tackles for loss among conference opponents and second in sacks), defensive end Quinton Bell (ranks eighth in sacks), defensive lineman Ronald Collins (25 tackles) and corner Ju’Anthony Parker. If JSU can secure a win against Prairie View, the Tigers will remain alive for another week. After facing its final SWAC West test on Saturday, things get even harder as the Tigers final two games are against SWAC East opponents in two road games against Alabama State (2-5, 1-2) and the Soul Bowl versus Alcorn State (7-2, 6-1) in Lorman on the reservation. The first order of business, however, is taking care of Prairie View. Kickoff is set for 2 p.m.